The joys of a single pot recipe are hard to summarize. Well, that’s not quite true: the words one pot casserole make most of us very happy. This recipe turns super-convenient and frozen meatballs into a creamy, slightly cheese main dish, complete with the vegetables built right in. You could use other vegetables, such as broccoli or asparagus in place of the broccoli rabe if you like, and keep changing this dish up with the seasons. Another way to vary things up is to experiment with different flavors of frozen meatballs. A bag or two of meatballs in the freezer has saved dinner many a time. This dish was almost risotto like, though it uses rice-shaped orzo pasta instead of rice, and involves with much less stirring. Even though this recipe says serves 8, my family of 4 did some pretty serious damage to the casserole…but there were thankfully still leftovers. There is more pasta than meatballs, though, since my kids went back into the pot, and plucked out the meatballs for their second servings! In a large Dutch oven or heavy pot heat 1 tablespoon of the oil over medium high heat. Add the garlic, broccoli rabe, hot pepper flakes, and salt. Cook, stirring frequently, until the broccoli rabe is crisp tender, about 4 minutes. Transfer the broccoli rabe to a plate. Return the pot to medium high heat, add the remaining tablespoon olive oil, and then add the onions. Saute the onions for 2 minutes, then add the orzo. Cook, stirring frequently until the orzo turns lightly golden and is coated with the oil, about 1 minute. Add the chicken broth and the frozen meatballs, stir, cover and bring to a simmer over high heat. 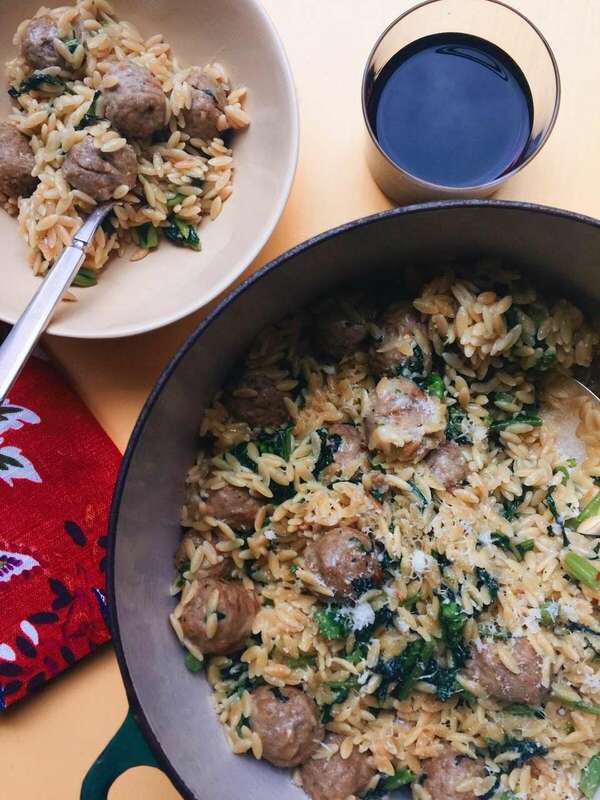 Reduce the heat to keep the liquid at a simmer, partially cover the pot, and cook for about 10 minutes, stirring frequently, until the meatballs are cooked through and the orzo is tender and has absorbed almost all of the liquid. Stir in the cooked broccoli rabe and the Parmesan, and serve hot, with extra Parmesan on the side for sprinkling.